From time to time you might find some maggots in a worm farm. Once a worm farm is well established you might find quite a lot of different creatures inside the bin that are sharing the space with your worm herd. Most of them are harmless and in fact are part of the natural recycling process. Creatures like springtails and woodlice for example should be welcomed inhabitants of a well established worm farm. 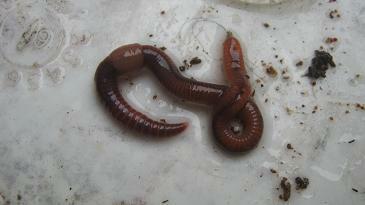 Other creatures like centipedes and slugs can actually actively prey on your earthworms. But luckily the losses to those predators are usually not that significant. But what should we do if we find maggots in a worm farm? The answer to this questions depends on the kind of maggot that is found in a worm bin. 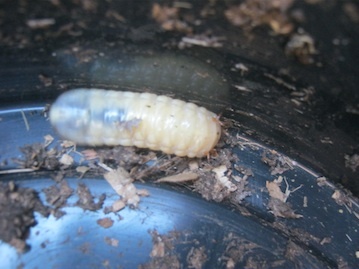 There are 3 different kinds of maggots that can occur in worm farms from time to time. The black soldier flies like to lay their eggs into vegetable rich matter and their maggots once they become active are ferocious creatures that will recycle lots of organic waste into compost. The problem you are facing once you have those maggots in a worm farm is the fact that compost worms don't like to share their space with them and the worms will either crawl out of their bin or dive down deeper into the lower parts of their bedding where they will eventually die. 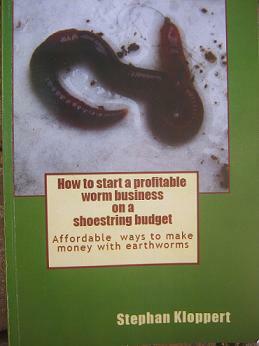 The contents of the worm farm will become a soggy and smelly mess and you will have to start your worm farm from scratch with a new batch of worms. In order to prevent the loss of your worms you must remove the BSF maggots from your worm farm as soon as possible. They are usually all close to the surface feeding on anything they fancy. When we find those maggots we collect them all and either place them into a separate compost heap or feed them to our chickens or fish. 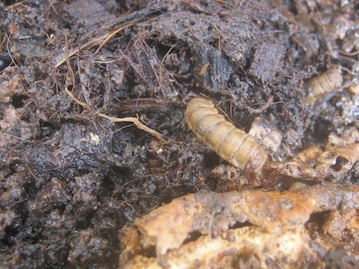 Many beetles like to let their maggots grow up in an environment that contains a lot of organic matter. Thats why they can often be found in compost heaps and if the beetles gained access to your worm bin as well in worm farms. Compost worms don't seem to have a problem with those maggots which can grow to a length of about 2 inches / 5 cm and become as thick as an average finger of a man. We usually either use those maggots as bait for fresh water fish or feed them to our chickens or koi fish. They are only about 5mm / 5th of an inch long but in my opinion can become the biggest head ache once one has those maggots in a worm farm. They multiply at an incredible speed and can quickly get out of hand. House flies are attracted to animal blood and dog poop and any bit of old meat or fish lying somewhere accessible will let them swarm in faster than one can imagine. They will place their eggs in the rotting meat and their maggots will feed on it. Flies can apparently smell animal blood from a distance of more than 8km / 5 miles. So it is vital to make sure they can't gain access to your worm bin if you want to recycle any old meat or fish in it. Should you find house fly maggots in your worm farm you should remove them immediately and place them in a bucket. Than pore boiling water over them. Once they are dead and the water has cooled down you can dig a trench into your worm farm bedding and dump the maggots in it. They will become a nice food source for your worms. 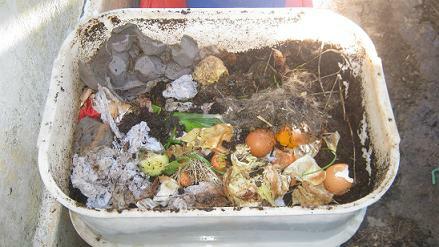 For more worm compost related information! Type your question or keywords (for example “earthworm”) into the search box below. 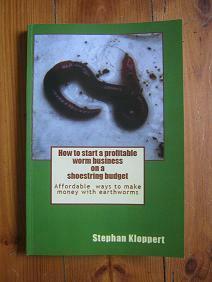 Worms convert horse manure into plant food! 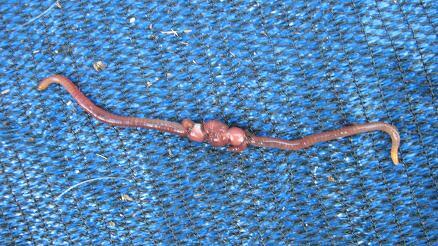 10 good reasons to start a worm farm!